Over the last few months, I have been hiring for my start-ups and the experience has not been good! You would expect that in a country (Kenya) with up to 22% unemployment rate (the largest in the region) could have lots of skilled people flooding the market with minimal opportunities to absorb them. But no. There’s a huge skills gap especially in the context of digitization. The digital economy is ruling the world! The Digital Economy is worth three trillion dollars today, all of which was generated in the last 20 years since the launch of the internet. Most valuable companies are tech companies founded within the last 2 decades, and what they did is disrupt the traditional systems. And one thing linking them all is that they are offering data driven services. To thrive, we need digital skills to drive entrepreneurship and innovation in this economy. When we trace our growth into the digital economy, we look at the immediate predecessor, whose main goal was around enhancing human ability to do things better. Unfortunately, most technologies developed in this era have remained for the top 1-2 Billion people. Most of the digital economy is fundamentally built around the future of work (the gig economy), future of mobility and the sharing economy, all of which are designed to bring the cost of access and ownership to almost zero, by leveraging on the basic principle of turning high cost products into services to enable cost sharing. This is made possible by the applying the emerging digital technologies like Big data, AI and IoT. Essentially, the digital economy is driven by IoT. Not internet of things but rather Integration of Technologies. Currently, we are witnessing a period of confluence and convergence of different technologies and industries. This technologies hold great promises but they also pose significant challenges to society, enterprises and individuals. To thrive and win in this economy, it boils down to how we integrate and use these technologies better than anyone else. It’s no longer the limitation of technologies that prevent us from solving problems, growing and competing, it’s the limitation of our imagination to creatively integrate this technologies. Similar to the three preceding revolutions, technological innovations in these digital economy will boost efficiency, productivity and enhance comfort and quality of life. But it will also introduce disruptions to enterprises and individuals alike. From a business perspective, businesses will be forced to redefine, reimagine and reinvent their business models and value prepositions or face the risk of getting disrupted. From an individual perspective, the digital economy will fundamentally change the way we work, live, learn and communicate. Many of our jobs will be displaced or replaced with advanced intelligence and robots. We will be forced to Re-learn, Retrain and Retool ourselves CONSTANTLY in order to acquire the right skills, and knowledge to remain relevant in the market place. Technical skills layer: Technology, in todays’ world, it’s all about IoT. The ability to connect sensors to connect smart homes, smart buildings, smart cities and smart grids. Robotics and Artificial intelligence such as Machine learning, deep learning. It’s about mobility, cloud, information infrastructure such as 5G, next generation mobile networks etc. Data layer: with over 30 Billion connected devices by 2020, which means there will be an explosion of both structured and unstructured data. 90% of the data in the world has been created in the last 2 years alone!! With 6B expected people on the internet by 2020, this means that data will continue growing exponentially in terms of Velocity, volume and variety. There is a huge demand for data scientists, mathematicians and data analysts to turn this data into useable insights in order to gain advantage and solve problems. Security layer: How do we secure these technologies from being hacked, and protect the explosion of data from being compromised. This is where the emergence of technologies like block chain come in. Problem solving: Our value add lies in the ability to solve problems. The more complex problems we can solve, the more valuable we are. This requires us to think critically and creative. What can we integrate, build, invent to boost productivity, improve customer experience and solve some of the world’s biggest problems like poverty, pollution, hunger, water etc. Decision Making: How do we use our good judgement and intuition to make fast and good decisions? Already we are moving from just Big Data to Fast Data. Analyzing millions of data to give time critical decision as seen in Computer Aided Trading. Collaboration: As the world becomes more digital, there is more economic interdependence and integration, learning how to work collaboratively with different people in different places and different views to create value is important. Communication & Leadership: It touches on all the above, and by increasing and continuously enhancing the above skills, we by virtue increase our leadership skills. Infrastructure (Internet access): Access to the internet should be a BASIC RIGHT to everyone especially in the developing world. Lack of access to it limits opportunities in the new digital economy. Developing countries are leapfrogging into digitization, which means, Most of the basic services are moving online, and when this basic services can’t be accessed due to lack of connectivity, it amounts to injustice. ( A good example is what countries like Kenya has done with e-government services through e-citizen portal) Here lies an opportunity for entrepreneurs to build connectivity solutions, ranging from mini Wi-Fi networks for remote areas to internet balloons in order to bring aboard the Close to 5 Billion currently left out. This is huge! Services: The digital economy is service driven. Most of the product we buy today will become services in the advent of the sharing economy. People won’t own cars, but they’ll ride in one whenever they want. Few will own a home but many will live wherever comfortably. They won’t own clothes but they’ll be well dressed in the advent of clothing as a service. This makes economic sense as we will need less investments to acquire equipment or assets that can serve more people. It is pure optimization. And Technologies such as AI and IoT are enabling this sharing economy thrive especially in emerging markets. We’re seeing farmers accessing tractors that initially were too expensive to obtain. Same in happening to farm services like financing where we’re seeing more and more companies building data driven platforms for crowdfunding rural farmers. We still won’t rule out the need for products for the digital economy, but one thing that shall stand out is that every new product presented in the market shall only be preceded by a series of services built on top of it. I believe the that the digital economy is solely a golden opportunity for Africa to leapfrog and lead all other continents into the a more sustainable development. It’s a ripe market full of opportunities, especially in infrastructure, water , food, logistics etc. Part of the excerpt from a keynote I have at the International Telecommunications Union address in Santo Domingo in July 2018 where I was recognised and awarded for the role in capacity building for the digital economy. 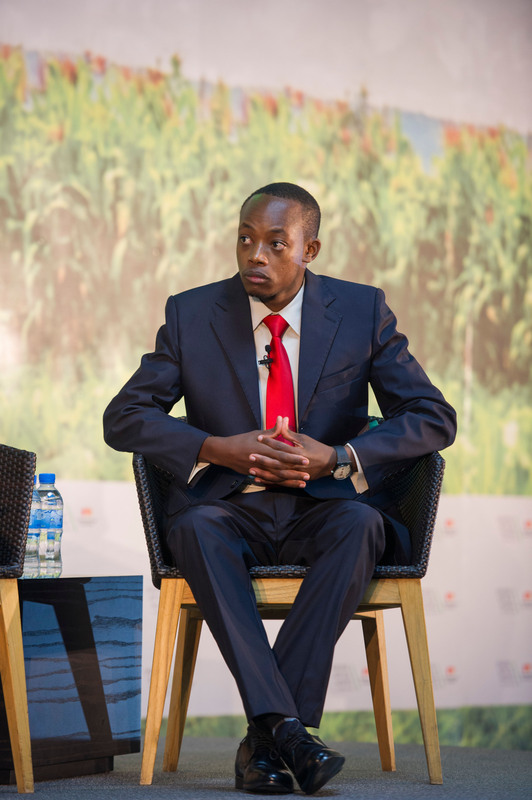 Brian Bosire is an entrepreneur, founder of two tech companies in Agriculture and water. HydroIQ is the world’s first VWNO. We use internet connected devices that are plugged into existing water supply networks to detect water leaks in real-time, and automate payments on PAYGO basis using mobile money. Our mission is to turn traditional water networks to smart water grids. UjuziKilimo is Africa’s first agtech company using IoT, data analytics and AI to inform the Ag industry. We collect and analyze millions of data sets from satellites and field sensors to deliver actionable insights to farmers on best ways to utilize resources like water and fertilizer while enabling the industry deliver data driven services to them.